It's been a pretty hectic month and very, very hot! 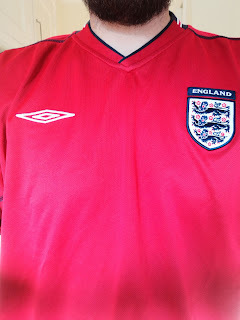 The World Cup was surprisingly entertaining and for once the England team did us proud - it almost came home! I think we would have been thrashed in the final but there are promising signs for once. It was Nicky's first proper World Cup and he really got into it, he was a little upset at the end of the semi-final as you might expect. I bet tickets for the next England game at Wembley won't be so easy to come by as when we went in March! 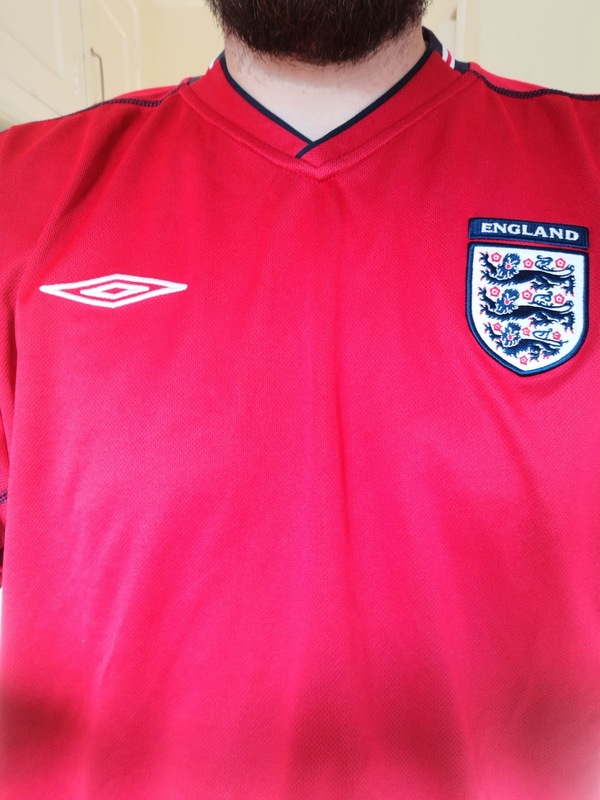 My 'lucky' England shirt from 2002 which I wore from the Colombia game onwards. I guess it wasn't that lucky in the end! The heatwave is showing no signs of disappearing. I have the stupidest tan lines from long training rides in the sun, my jersey sleeves are different lengths so my arms look like Neapolitan ice-cream! Speaking of which, RideLondon is on Sunday and my training is more or less complete, I've got a couple of 30 minutes rides to do before then. I've booked a hotel for the Saturday night so I'm not panicking so much on Sunday morning - last time I did it I was running late and ended up having to sprint to the Olympic Park, not the best preparation for a long ride! I'm raising money for BHF, I got a ballot place but wanted to try and raise some money too - I have a JustGiving page if anyone is feeling generous! I'm torn between wanting the heatwave to end and wanting it to continue a little longer - we're going to the Isle of Wight in a week and a half and having a sunny week would be great - we could spend more time on the beach, whereas last year we had a lot of rainy days. I'd also prefer RideLondon to be dry! On the other hand, it'd be nice to have a decent night's sleep for once.